The opening of the exhibition “Artistic Expressions” at the Grenada Arts Council gallery on Young Street Tuesday evening was an exercise in forward ever. 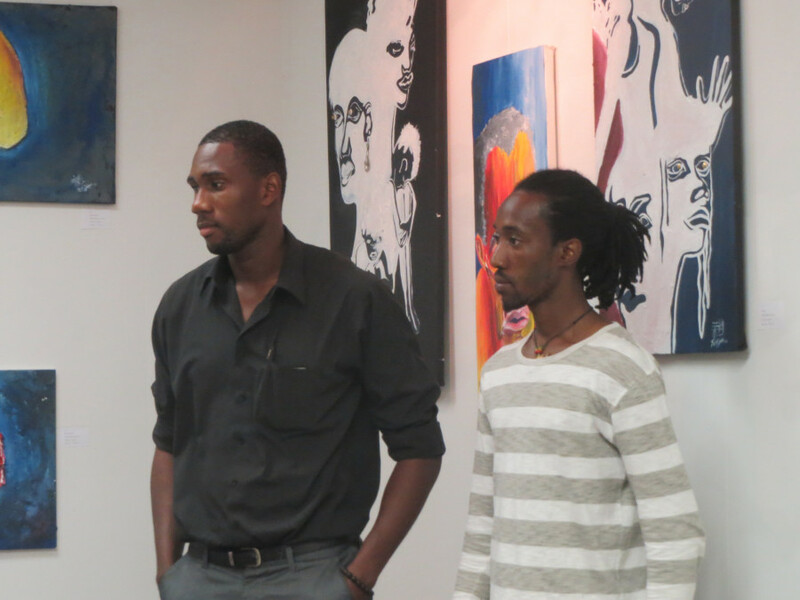 Two young Grenadian Artists, Teddy Frederick and Nico Thomas were the instigators and organisers of this thoughtful, fresh display of talent. Only five artists are shown, but the work tells a story of deep exploration in the culture of the now in Grenada. Painting, photography, and 3-D mixed media painting portray emotions, conditions, expectations, and fascinations. Given the floor, Teddy Frederick shared that after his travels to China and France and seeing the works of art there, he is determined for his work to be different to anyone else’s, and uses techniques that are hard to figure out. Others may try to imitate him, but it won’t be easy. During a period of questions and answers, Nico shared about one painting in particular that is entitled “Combining Cultures.” In this highly detailed, finely rendered painting, clock towers and great houses are portrayed. Nico shared his deep understanding of the Indonesian culture (where he studied art) and how willingly and passionately they protect their historic buildings. He contrasted that in the painting with the lack of care or consideration given Grenada’s historic buildings by government or anyone else. An intensely thoughtful young man, his love of Grenada always comes through in his painting. Work by Jesma Noel, Jason Campbell and Tikisha Williams were also shared. All are essentially self-taught artists, and have been showing significant strides in their work as they continue to hone their skills. Jessma is a student at SGU, Jason uses his work to support himself, and Tikisha works for Art Fabrik as her day job. Prints of the work of Teddy and Nico were on sale, and the patrons of the art who were there willingly purchased to help support the efforts of these young people. 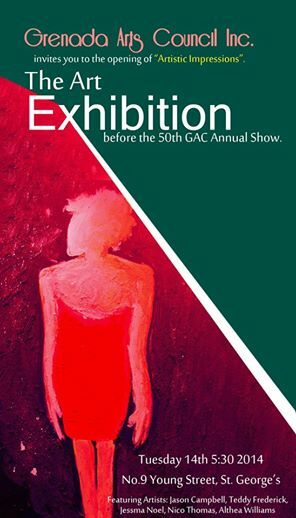 The exhibition will continue until 12 February, and is followed by the 50th Annual Exhibition of the Grenada Arts Council. Opening hours are 10 am to 5 pm, Mon–Fri, and admission is free. (Donations are appreciated).